Udupi, Jan 24, 2018: Union Minister for Drinking Water and Sanitation, Uma Bharathi visited Pejawar Mutt on January 24, Wednesday and enquired about the health of Sri Vishwesha Theertha Swamiji who has suffered a back injury during a recent travel. Speaking to media men present outside the Mutt, Uma Bharathi said she came to Udupi as she was worried about the health of the Pejawar seer. 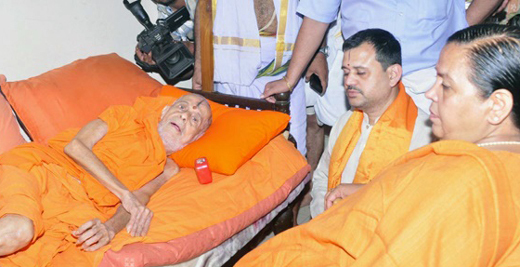 Stating that the Swamiji has recovered from the injury she also added that he has been advised rest for 20 days. Uma Bharathi also said a programme would be held in Udupi to mark the completion of Pejawar Swamiji’s fifth Paryaya once he recovers and added the date would be fixed after consulting all those concerned. She refused to comment on Chief Minister Siddaramaiah not choosing to visit the Krishna Mutt during his visits to Udupi. Uma Bharathi will also be meeting the Paryaya seer Si Vidadheesha Theertha of Phalimar Mutt.